Cinema has long been, and remains today, the best showcase for new films. Some films might stay in cinemas for weeks on end whilst others might disappear very rapidly. One thing is for sure – films do not just appear in cinemas by chance. The film distributor will consider carefully a number of factors when planning the release of a film in cinemas and across other digital formats. 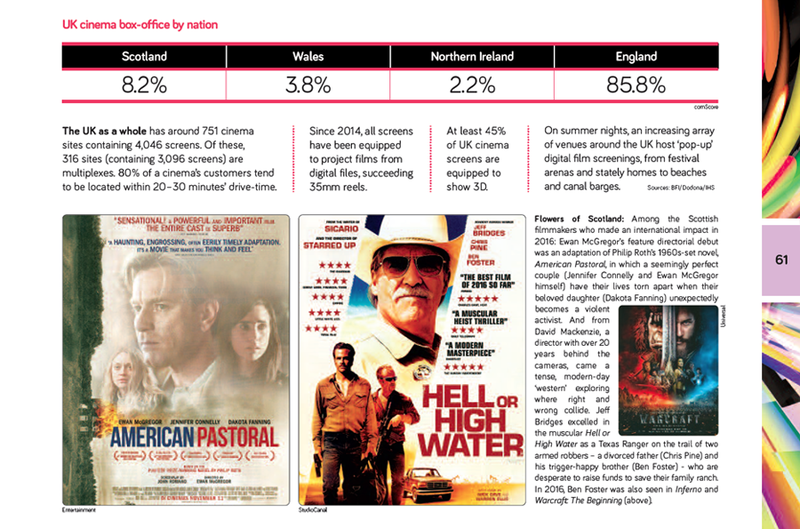 We can look at these four key areas and see how in 2016 they affected the ways in which films were released in the UK. Who is the target audience(s) for the film? When is the best time to release the film in order to reach the target audience and as far as possible avoid other, directly competing, titles? Where are the most appropriate cinema screens to show this film and are they available? How will the film be promoted, and with what budget? The distributor of a film has to consider who is the target audience for each film they are releasing. At the same time they need to consider who are the main age ranges who visit the cinema in order to have the right product to reach this age range. This is really a case of supply and demand. Look at the two charts which show firstly the demographics of the UK in terms of age. 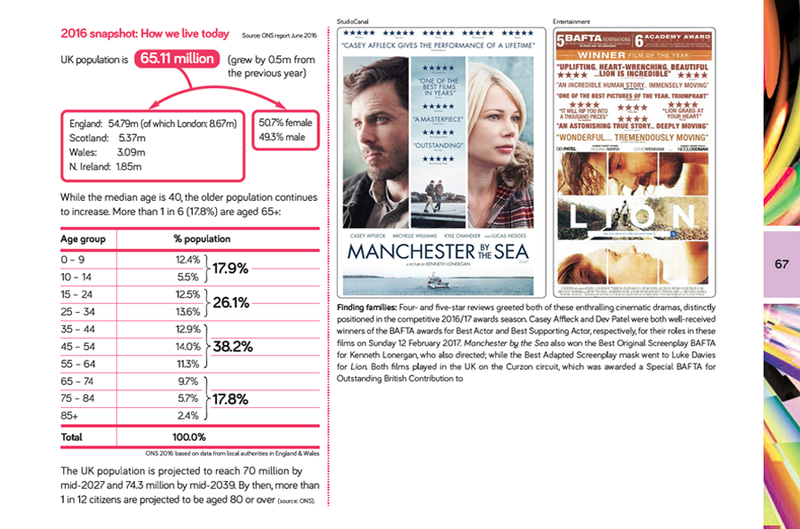 Then look at the chart which shows the demographics of the cinema going audience. It’s interesting to note that whilst 15-24 year olds only make up 12.5% of the population, they represent 29% of cinemagoers. Look back at your top 100 chart. Can you identify films which you think really appeal to this age group? Where are they in terms of the top 100 films? At the top or at the bottom? What about the films in the 90-100 bracket of the top 100? Who do you think they might appeal to? As a distributor, if you are going to release a family film, for example, then you will probably want to do this when children are on holiday. For other genres the distributor needs to carefully consider when, for example, the best times might be to release a comedy or an adventure drama. Look at the information presented in the charts which shows the performance of films month by month during 2016. Which seem to be the most popular months for visiting the cinema? Do you think that this is simply because of the films that are available then? Or are there other factors? What might these be? Why, for example, should box office be higher in April than in March? (a hint – Easter in 2016 was early April). Why should admissions in July and August be so high? Look back at the top 100 films for 2016. When were the top ten released? Can you list the films which were released in July and August? What do they have in common? Similarly, look at the films released in January and February. What do they have in common? Look at the top 15 weekends for box office during 2016. Is there any similarity in the types of films being show during those weekends? What factors can you identify in each weekend which would make them so successful in terms of box office? Distributors also have to bear in mind what might affect the release date of a film. For example, are there big sporting events taking place such as the Olympics or a football tournament? How might these affect the types of people who could go to the cinema? Different releases are managed in different ways. For example, a 'saturation' release at cinemas everywhere may open simultaneously on 1,000 screens UK-wide, playing at two or more screens per multiplex. (The UK has around 4,000 cinema screens in total). This strategy, usually deployed for 'tentpole' titles such as large-scale sequels or the latest popular ’franchise’ entries, helps to accommodate mass audiences eager to consume a film at the earliest opportunity. By contrast, specialised films offer a different cinematic experience. The UK release of, say, a documentary, foreign language film or revived classic may comprise 25 prints or fewer. Initially, it may play in selected key locations where local audiences are known to favour such titles before potentially showing more widely in subsequent weeks. Very exceptionally, a film may be 'platformed' in a single location before rolling out. 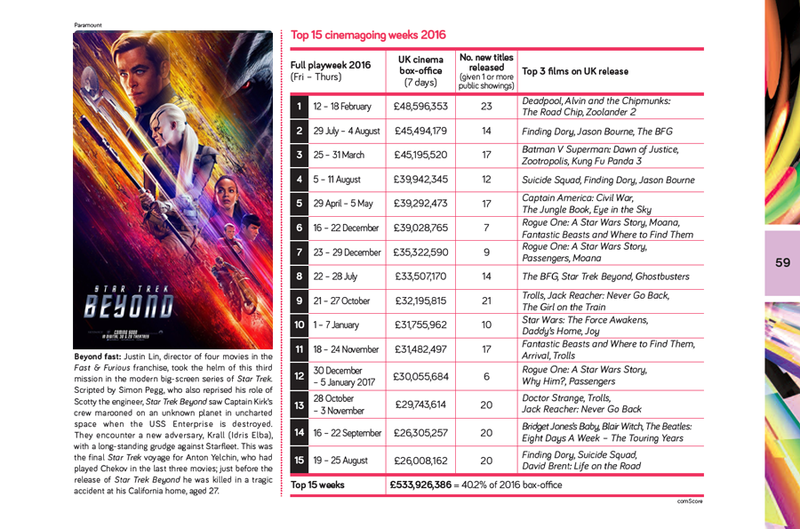 Most films released in the UK have what may be termed a ’limited’ release with fewer than 100 prints. Looking at the spread of the number of cinemas per region, , where might a limited release of a film be more successful? Look in particular at the gross box office for each region. Why do you think that London has the biggest box office across all of the UK? Calculate the number of people per screen there are in each of the English and Welsh regions. Carry out a similar exercise for Scotland and Ireland. How might this affect the release of a film? 65% of the market share of box office in 2016 was divided between four major studios Two other majors appear in the top 10 distributors whilst independent distributors such as eOne and Lionsgate also make the top 10. Now look at numbers 11 - 20 in the market. Their market share is only 4%. Why do you think that the major studios have the lion’s share of the market? What types of films do they produce and release? Again, go back to your top. 100 list and identify the distributors of the top 20 films. How does this list compare to the overall market share of each of the top five distributors? Why do you think that Walt Disney, releasing only 18 films, has more market share than, for example, 20th Century Fox or Universal who released more than twice that number in 2016? 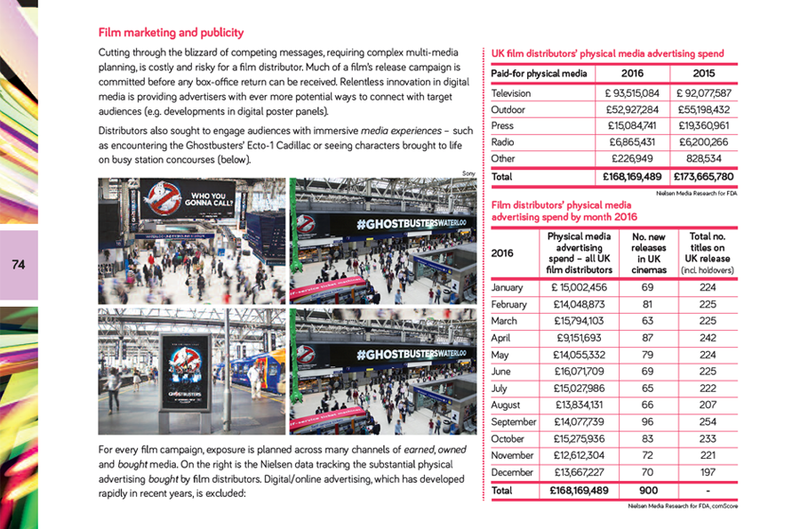 Look at the actual amounts of money spent on advertising films. Although more films were released in 2016, the advertising spend has decreased on actual physical media such as posters and television spots. Why do you think this is? Look at the monthly spend on advertising. How would you account for the different spends per month given the number of films released per month? Where do you find out about films? How important is social media in helping you not only find out about films but also in helping you decide which films to go and see? 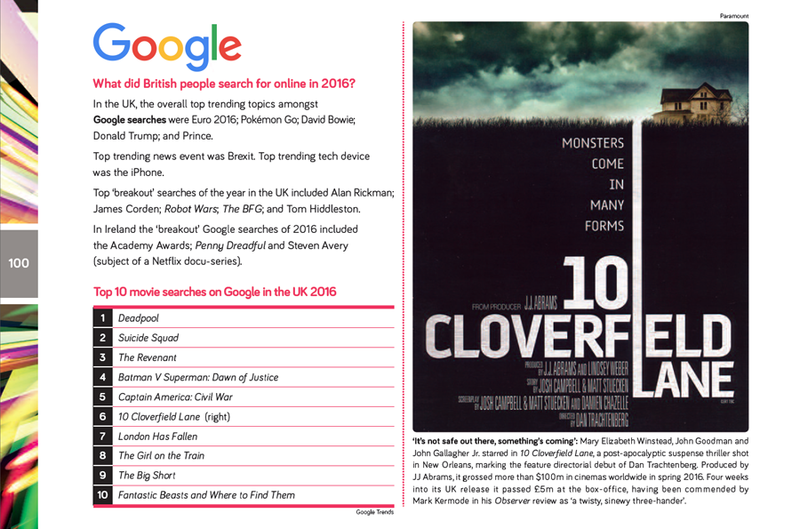 Looking at the facts and figures regarding film and social media such as Twitter and Facebook, as well as the ways in which we find out about film through Google, make a case for distributors using social media more in promoting their films.